La Grenouillere was a riverside bathing and boating resort, popular among weekend trippers during the Second Empire (1852-1870) and after. It had a floating restaurant which is seen in another of the paintings executed by Monet during his two-month stay there in the late summer of 1869, and it appears in similar works by Renoir often painted sitting alongside Monet. The resort was situated on the Ile de Croissy, facing the left bank of the Seine. SPECIAL NOTE : The painter will make the reproduction as close to the original oil painting as possible. 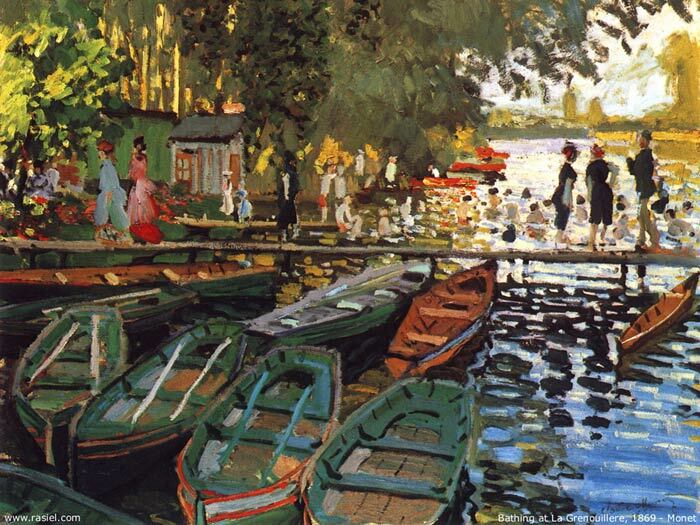 If you want your painting to alter from this likeness, please email us and " Bathing at la Grenouillere " will be reproduced according to your special requirements.